We’ve said it before and we’ll say it again: potatoes are the backbone of any meal and have the power to totally steal the show. 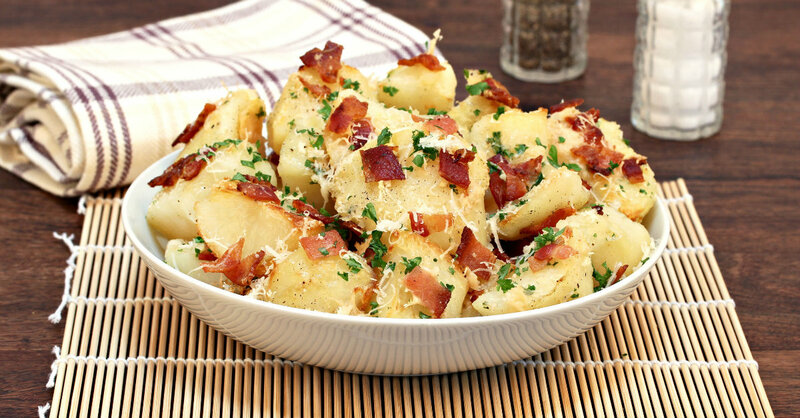 Here, we’ve got a showstopping recipe consisting of deliciously roasted potatoes, spruced up with all things good: bacon, garlic, and parmesan cheese. While this might not be the first time you’ve incorporated these flavors into your tots, it seriously doesn’t get better than this; the potatoes and bacon are perfectly crispy, and the cheese and garlic offer up the perfect balance of flavors to tie everything together. We’re obsessed with this dish and you will be too! Reserve 1-2 tablespoons bacon drippings and discard the rest. Place potatoes in a large bowl and toss with reserved drippings and minced garlic until evenly coated. Season generously with onion powder, salt and pepper, and mix together, then spread out on a baking sheet in a single layer. Bake for 45-50 minutes (and add bacon bits during the last 15 minutes of cooking), tossing in the middle, or until fork tender and golden brown. Remove from oven and toss with parmesan cheese and parsley.